Sunday, April 11th: We’ll Miss You, Arlene. I didn't realize how effectively camera shy Anselmo's Arlene Dabrusca was with me until I tried to find a file photo of her amongst the thousands I've taken at Ballard Farmers Market over the last five years. And while you can't actually see her face in this one, it is representative of what she stood for at Ballard Farmers Market. Here, Arlene has her face buried in the chest of her daughter, Marie, on a very cold November day in 2005, back when the Market still used to retreat into that little lot off Ballard Avenue, before we were on the street year-round. (Moshi Moshi now sits where that lot used to be.) You see, Arlene showed up every Sunday that Ballard Farmers Market has existed, regardless of the weather, until just recently. So while she may have been hiding from the camera, or protecting herself from the cold, still she was there, always. Photo copyright 2005, 2010 by Zachary D. Lyons. It is with profound sadness that I must tell you of the passing of Arlene Dabrusca of Anselmos, one of Ballard Farmers Market’s founding farms. Arlene died suddenly Saturday, after successfully undergoing treatment for cancer over the past several months. Arlene, with partner Chuck Long, started Anselmos in 1998. Arlene had been a nurse, her daughter, Marie, worked in the health insurance industry, and Chuck was an auto mechanic. Chuck wanted to grow organic vegetables, so they got a 4-acre patch of dirt in Mukilteo. They originally sold at Fremont Sunday Market, as well as several other markets. They followed Market Master Judy Kirkhuff to the U.S. Bank parking lot in Ballard (where the library is now) in August 2000, when redevelopment in Fremont forced the Fremont Sunday Market to move to a location that hurt farmer sales. During the first winter in Ballard — the winter of 2000-2001 — Arlene faithfully represented Anselmos in the U.S. Bank parking lot every Sunday without fail. In fact, for almost all of that winter, Arlene and Marie were the only farmers at the market. “We would give people bags through their car windows in the rain,” Arlene told me some time back. “It was a drive-up market!” Indeed, says Judy, Arlene was a trooper through rain and snow and cold to provide service to her loyal customers. And her customers were loyal. “One loyal Market friend, Jason, would hang with us, make us feel safe, and then help us break down” Arlene told me. In 2001, Anselmos moved to a 28-acre parcel in Machias, in Snohomish County, where they began cultivating 10-12 acres, and where they produced greens all winter in their 90′ x 20′ greenhouse. By the winter of 2001-2002, they had been joined by five other vendors in a little off of Ballard Avenue (where Moshi Moshi resides now) after the Market moved to Ballard Avenue in late 2001. 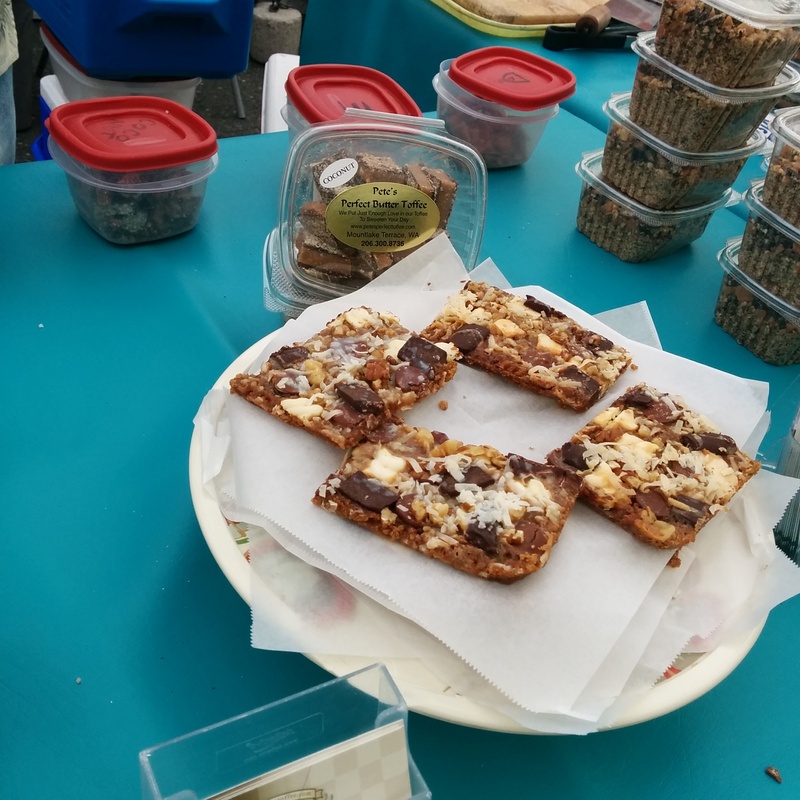 Anselmos eventually stopped selling at any other farmers markets because of the support they had in Ballard. “The customers we got when we were alone in the U.S. Bank lot still buy from us today,” Arlene told me in early 2009. “We love the folks in Ballard.” And Ballard loved her back. We truly owe a debt of gratitude to Arlene. Without her commitment to Ballard Farmers Market and the people of Ballard, we might not have seen to creation of the first year-round farmers market in Seattle, which has, in turn, inspired other markets to operate year-round. One farmer, standing alone in cold winter rain forged a path for what we know today as this amazing weekly event called that Ballard Farmers Market that, during March, drew more than 9,000 people per week to a neighborhood that once was a ghost town on Sundays. Arlene, thank you. You will be missed. Arlene had some medical coverage from Medicare, but it was insufficient. As a result, Arlene’s family is left behind not only with their grief, but with thousands in unresolved medical expenses. There are two things you can do to help. First, you can make a donation to a fund to help her family retire her medical debt at the Ballard Farmers Market Information table at the Vernon Place end of the Market. Second, you can continue to fight for real health care reform. Do it for Arlene. Do it for the other farmers you see every week at the Market, and for the artists and buskers, most of whom also live without health insurance. These are the people who feed our bodies and nourish our souls, and it is unforgivable that in a country as rich as ours that we would turn our backs on these people just because they are not part of some major corporation that has a health plan. You love Ballard Farmers Market for these people because they are independent. Why shouldn’t they be covered by the same kind of health care system found in Canada, Mexico, Brazil and just about every country in Europe? Be sad today for the loss of our dear friend, Arlene. Then wake up tomorrow mad as hell and see to it some real change takes place. Anthony Estrella shows off some Jalapeno Buttery cheese from Estrella Family Creamery. Photo copyright 2009 by Zachary D. Lyons. I am not going to spend much time speaking of other vendors today, but one in particular requires mentioning. 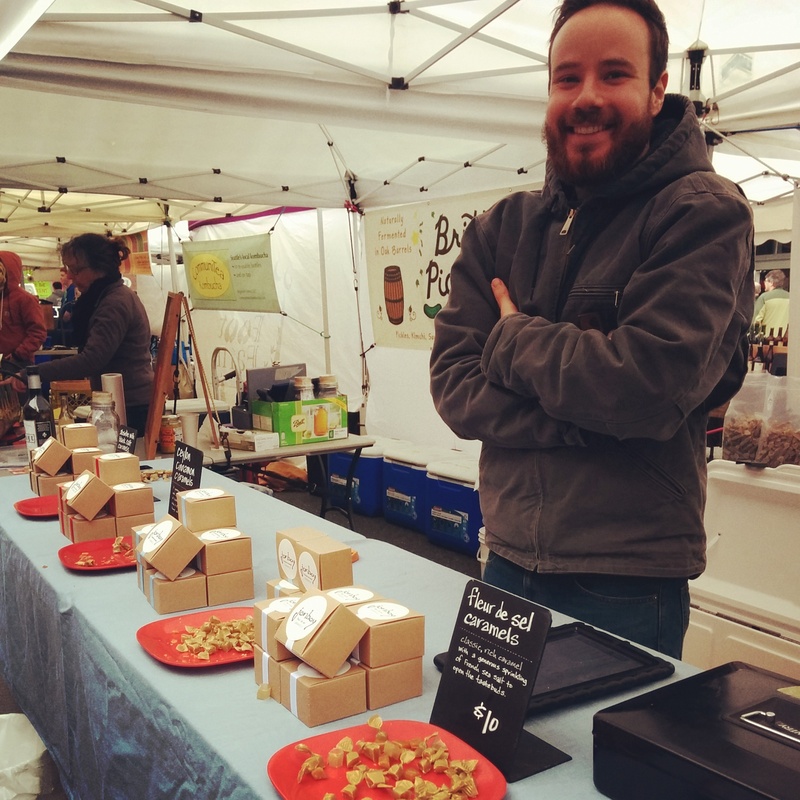 Estrella Family Creamery returns to Ballard Farmers Market today after a long absence. The Estrellas have been suffering from a different kind of hardship in recent months, though they would be the first to tell you that it pales in comparison to the lose of a loved one. Still, earlier this year, health officials discovered that one of their three cheese-aging caves had become contaminated with listeria, a dangerous food-borne pathogen. While no illnesses have ever been reported as result, the Estrellas still recalled several cheeses and destroyed tens of thousands of dollars in product. Then, they had to completely strip clean, sanitize and rebuild the cave in question and start over from scratch making the cheeses housed in that cave. Just to put this in perspective, the minimum time any one of Estrella’s cheese is required by law to be aged is 60 days. They age many of them longer. And, of course, they lost weeks of sales, too. While they will be back at Ballard today, it will be with an inventory limited to their two remaining caves, which both tested clean. That said, do buy their cheese today and welcome them back. The best thing you can do to help the Estrellas get back on their feet making some of the world’s best cheeses (and they have the awards to prove it) is to buy it from them now, and to share with them some love.